Photo above. The still-impressive remains of Jennett Road trench. Having reached the top of Artillery Row, you may want to descend again and continue your progress through Gully Ravine. However, if you can spare a further 45 minutes or so there is much to see where you are. 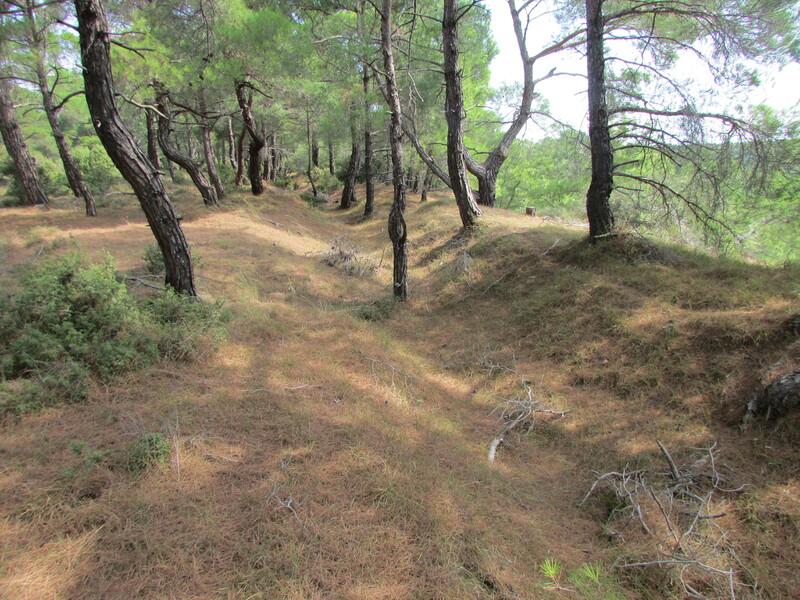 In 1915, Gully Spur was largely devoid of trees and scrub, and this seaward section, mainly held by the Indian 29th Brigade after the landings, saw steady but costly progress in terms of casualties as new trenches were taken and established and the front line was pushed slowly forward. If you turn right and walk north eastward along the woodland track for about 200 metres, you will be following the extreme left’s advance during the battles of Krithia and the Battle of Gully Ravine. At this stage, you will see that the trees and undergrowth on the right thins out. You are now above the area where the gully is very wide, opposite the lines on the far side to the east which led up to Gully Farm. If you intend to undertake this walk you should move slowly and carefully when going eastwards. You will be approaching steep slopes and some sheer drops in this area. Turn 90 degrees to the right and walk slowly and carefully through the multiple shallow trench lines, dugouts and evident shell holes. After some 70 metres you will come to the eastern edge of the spur and the very steep and sometimes sheer drop into the gully below. Immediately before this drop-off is a long and still impressively deep communications trench, running SW to NE along the very upper lip of the ravine, photo above. This is Jennett Road, (sometimes spelled ‘Jennet’ Road on maps), and it would have been a familiar thoroughfare for thousands of men as they trudged up to the lines on the left flank or back from them. It is likely to have been a mule trench, being originally very deep and wide. My early speculation was that the name might have come from the Spanish word for a small horse or a donkey, suggesting the structure’s purpose. However, some fine research by Noel Forde has identified 1105 Sapper Albert Jennett, who served with the 1st West Riding Field Company, Royal Engineers and who was awarded the D.C.M on 28th April 1915 for actions at Gallipoli. The chronology and the fact that Albert Jennett was an engineer support the possibility that when the trench was dug at a later date, probably in May 1915, it was named after him as a tribute to his gallantry. This is not yet entirely conclusive and research continues. Returning to the northward track, proceed forward until the fields at the end of the woodland become visible. Making a 90 degree left turn here takes you towards the cliff edge overlooking the sea, so again, caution is needed. You are now at Point P or P Point, photo below. GPS users should aim for 40° 5’25.97″N, 26°11’58.05″E. This appears to have been a forward lookout or guard post, and it was from here that Captain Jackson’s A Company of the 6th Gurkhas descended the cliffs to attack the Turkish redoubt on the headland beyond the next ravine. This took place on the night of 12/13th May 1915. The success of this assault led General Sir Ian Hamilton to issue a general order that the area secured should be known in future as Gurkha Bluff. 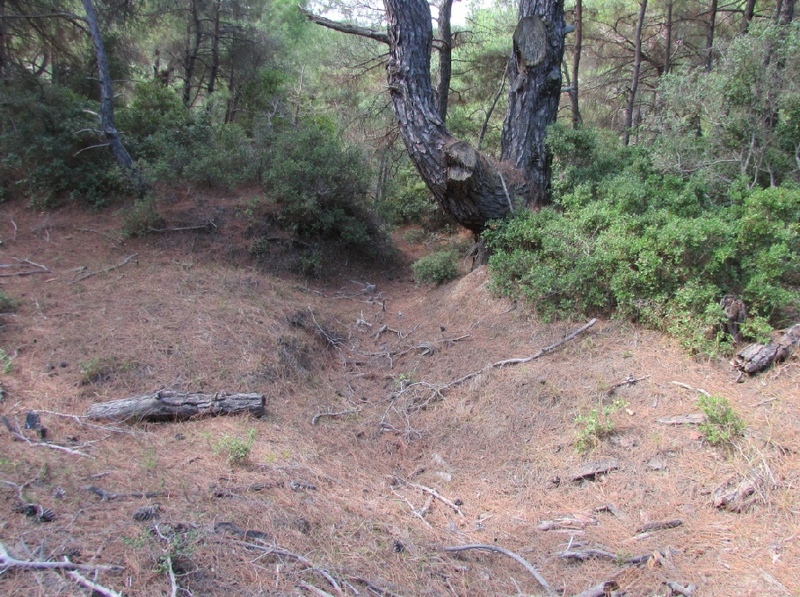 Some nice research work by Len Barnett has identifies that in WO 95/4310, concerning 86th Infantry Brigade HQ, there is an entry for 0800 on June 28th (the first day of the Battle of Gully Ravine), which states that ‘‘Brigade Headquarters moved temporarily to Point Pons Indian Mule Track’. This mule trench was certainly in the vicinity, and thus it appears that the ‘P’ is short for ‘Pons’, which is Latin for ‘bridge’ and is also the name for part of the brainstem in humans and other bipeds. Might this be an officer-style tongue-in-cheek allusion to the ‘brain’, the ‘nerve centre’, where HQ was located? More research needed!